A quarter century of journalistic encounters, cultural fulminations and notes on lost cities. 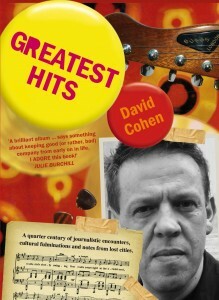 A high-school dropout from the Hutt Valley who accidentally discovered journalism, David Cohen offers an unorthodox and often provocative take on the world he encounters. His collected writing dispatched from points north and south has been published in journals as various as the Guardian, New York Times, NZ Listener and Jerusalem Report, and includes a media column in NBR and a sheaf of book and music reviews.